So what’s up our sleeves these days? After finishing our bicycle tour and thru-hike last year, we decided that it would be amazing to have several micro-adventures that would allow us to travel freely around the West’s crème de la crème–from America’s highest ranges to its deepest canyons, and most certainly everything in between. Free as our wills, our ventures will take us to places we’ve yet to explore, and also to places dear in our hearts (Big Sur and Colorado, we’re comin’ for you!). There are a couple bigger adventures we have planned though, with the first one starting in about a week. –First up is a combination of Steve Roper’s ‘Sierra High Route’ (SHR) with Dixon & Wilson’s ‘Southern Sierra High Route’ (SoSHR), following closely the Sierra Crest. One might dub this High Sierra rendezvous the ‘Long Sierra High Route’ (LSHR), perhaps. The route maintains elevations between 9,000 and 11,500 feet for the entire 250-some-odd miles. –After many adventures in the western mountains and southwestern deserts, we’ll find ourselves in the Northern Rockies for a high route in Wyoming’s Wind River Range, using beta from several sources to develop our own route through this rugged terrain. It will maintain elevation and run closely along the Continental Divide for over 100 miles. The Sierra High Route, Southern Sierra High Route, and the high route through the Winds are all magnificent, mostly off-trail routes that require map, compass, and route-finding skills, as well as a desire for the freedom of the hills. But where will you live?, the curious person might inquire. Easy answer: The insane home David sculpted for us out of a Kung-Fu master‘s contracting van. 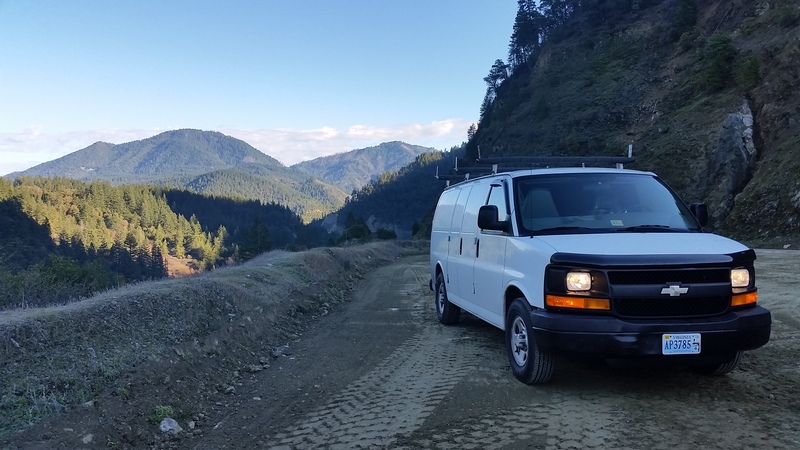 Chevy Express turned Adventure Mountain Mobile, David spent hundreds of laborious hours creating the van home we so lovingly named Van Occupanther (check out Midlake’s album using the same name). Absorbing our last couple days eating delicious meals, sleeping in warm, sprawling beds, and spending time with my amazing family before we encompass the lifestyle that both David and I feel most comfortable living: One that allows you to recognize and appreciate simplicity, and the joy of exploration. Thank you Carma, you’re amazing! Have a great time! Email me when you make your way to Big Sur – I’d love to see you both!